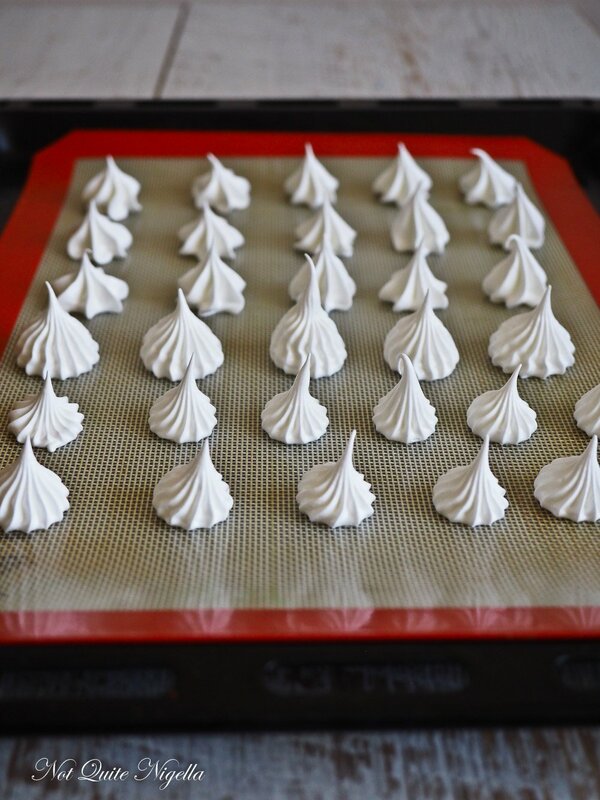 These tiny meringues make the most of the egg whites that you might have in your fridge and are an adorable Christmas gift. 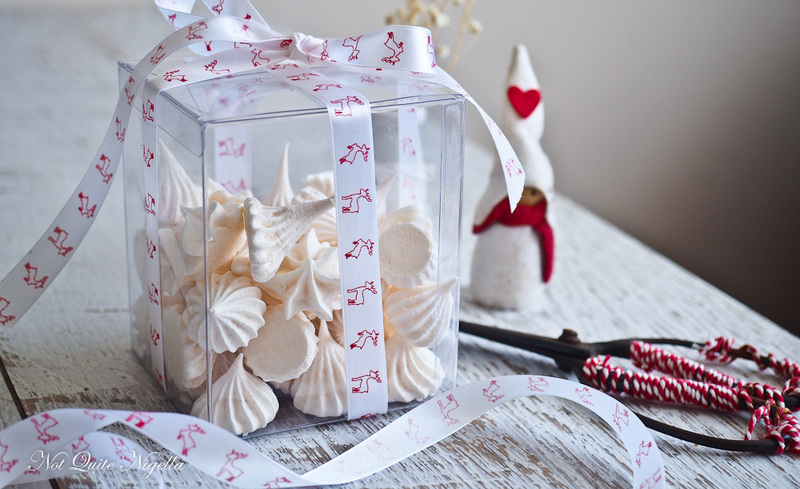 Give them to people to dress up a dessert, make an Eton mess or even decorate a fruit salad! The get those pretty swirls, all you need are egg whites, cream or tartar and sugar as well as the right piping tip. After that you can pipe swirls, logs or dollops to your heart's content. The best piping tips for these are the 6B/867 (I prefer 867 as they make better large dollops) for the fluted finish or the 1A for a plain dollop with a sharp point. Practice does make perfect with these as technique does play a part but within a dozen or two, you may be piping like a pro. I don't know about you Dear Reader, but I can't believe that it is almost Christmas time already! The only way I know if that I'm tired, so very tired and I really want a long sleep which is usually what I do over Christmas. The other day all we wanted to do was get the grocery shopping done and go home. Mr NQN, Mochi and I made our way to the car with our trolley full of food when my nose twitched. "Something smells terrible," I said to Mr NQN. I couldn't actually see that well-I had forgotten to put in my contacts or wear my glasses but I could see people gathered around an area in the car park, and I heard the sound of gushing water coming from one direction. "Isn't that where our car is?" I asked Mr NQN. He sighed and said, "Yup, our car is right in it." Our beloved car (yes I love my car) had some sewerage water pouring on it. Luckily, the centre staff were onto the case and one guy explained that they would make sure that the car was washed in the centre's car wash immediately and someone would remove it from near the spewing pipe right away. Another couple next to us overheard this exchange and sensing the opportunity for a free car wash complained that they drove through the dirty water and asked for their car to be washed too (they didn't get their wish). We sat with Mochi in the car wash waiting room tired and just wanting to be home but also hoping that there wouldn't be one of those instances of a Seinfeld episode come to life (the one where they can't get rid of the smell in the car). Thankfully it wasn't but we could have used some minty meringues that afternoon for both the minty aroma and for the sugar hit! So tell me Dear Reader, have you ever been in a Seinfeld episode come to life? 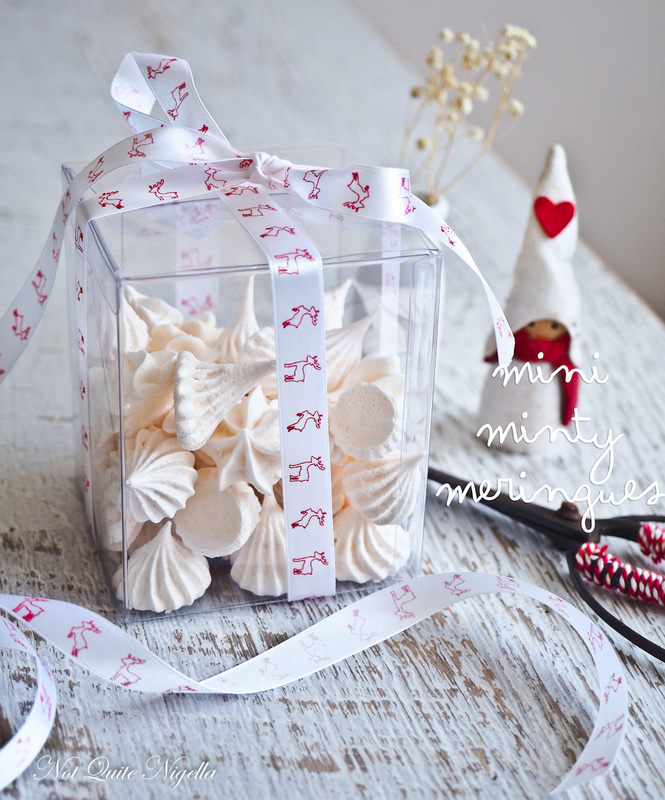 Do you give edible Christmas gifts? If so, what is your favourite edible gift to give? Step 1 - Make sure that your bowl and beaters are spotlessly clean. Line 3 trays with parchment and preheat oven to 100C/212F. Whisk the egg whites with the cream of tartar until soft peaks form. Then add the caster sugar gradually and a few drops of the peppermint essence and beat until the meringue is stiff and the bowl can be tipped upside down without the meringue moving. Step 2 - Fit the 867, 6B (both fluted) or 1A (plain) tip into a piping bag. Pipe onto the parchment. 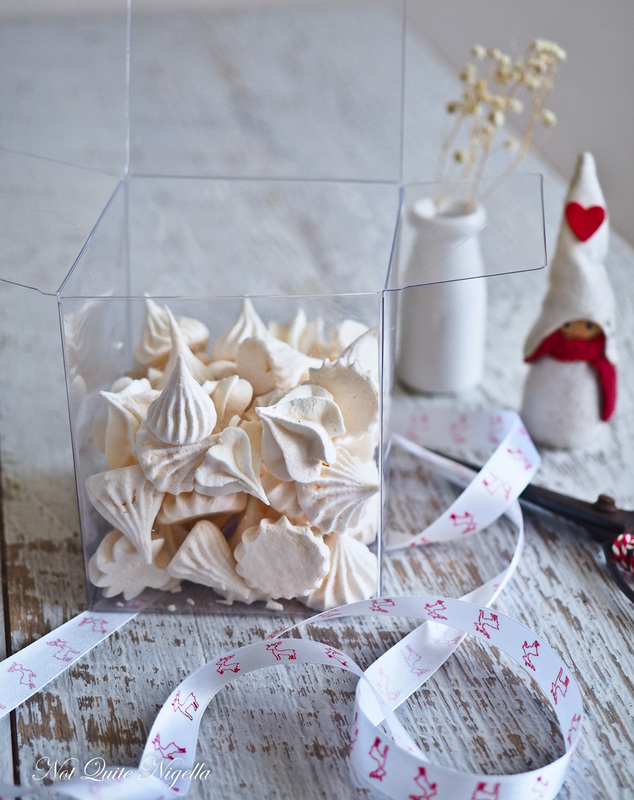 Your meringue kisses will get better with practice. Even once you've done half a tray you'll notice the subsequent ones are better. Bake in the oven for 2 hours and then turn off the heat and allow them to cool in the still hot oven.